Coming out of a small college, Coates was chosen by the Patriots in the fifth round of the 1991 NFL draft. He backed up TE Marv Cook for two seasons, catching a total of 30 passes, before breaking out in 1993 with 53 catches for 659 yards (12.4 avg.) and eight touchdowns. Patriots went 10-6 to finish second in the AFC East while leading the NFL in passing yards (4444) and qualified for the postseason as a Wild Card. Lost AFC Wild Card playoff to Cleveland Browns (20-13). The 1994 season, in which Coates set a then-NFL record for receptions by a tight end, was the first of five straight in which he was chosen to the Pro Bowl. In ’95, he caught 84 passes for 915 yards (10.9 avg.) and six TDs and was again a consensus first-team All-NFL selection. 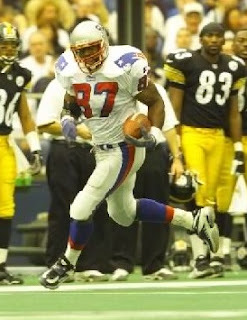 Coates was part of the 1996 AFC Championship team, with 6 receptions for 67 yards and a TD in the Super Bowl loss to Green Bay, and continued to be a capable receiver, although his blocking was not at the same level. With his production dropping to 32 catches for 370 yards in ’99, he was released by the Patriots and played one last season in 2000 as a reserve with the Baltimore Ravens. Overall, Coates caught 499 passes for 5555 yards (11.1 avg.) and 50 touchdowns, with 490 for 5471 yards and all of the TDs coming with New England. He was a consensus first-team All-NFL selection twice, received second-team All-league or All-AFC honors after two other seasons, and was selected to the Pro Bowl five times.